With the disenfranchisement of blacks at the turn of the 20th century after the Reconstruction era, Alabama Democrats suppressed populist challenges and the state became part of the " Solid South." This constitution was not initially supported by the majority of whites, but Democrats used the call of white supremacy to gain passage. In addition to wanting to affirm white supremacy, the planter and business elite were concerned about voting by lower-class and uneducated whites. Historian J. Morgan Kousser found, "They disfranchised these whites as willingly as they deprived blacks of the vote." After passage, the 1901 constitution's provisions for a grandfather clause, cumulative poll taxes, literacy tests, and increased residency requirements state, county and precinct effectively disenfranchised many poor whites as well, to enable elite control. Glenn Feldman has documented that in total, by 1941 more whites than blacks had been disenfranchised in Alabama under this constitution. The Democratic Party dominated politics in every Southern state. For nearly 100 years, local and state elections in Alabama were decided in the Democratic Party primary, with generally only token Republican challengers running in the General Election. 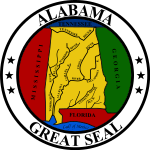 Republicans ran a token candidate in every Alabama gubernatorial election except for 1930 and 1962. Their highest vote total between disenfranchisement and 1966 was the 21.28% of the vote they gained in 1922. Alabama was unusual among Deep South states in even having a token Republican running in the gubernatorial election. In nearby states like Georgia, South Carolina, Louisiana and Mississippi, Republicans did not field a gubernatorial candidate until the 1960s. The state Democratic party's five-member election contest committee invalidated the primary election result, claiming that thousands of Republicans had "illegally" voted in the Democratic primary for Graddick. As a result, they removed Graddick from the ballot. The Democratic Party placed Baxley's name on the ballot as the Democratic candidate instead of Graddick. The voters of the state revolted at what they perceived as disenfranchisement of their right to vote and elected the Republican challenger, Guy Hunt, as governor. Hunt was nominated in a statewide Republican primary that had 28,000 participants compared to the 1,000,000 plus of the Democratic primary. That November Hunt became the first Republican governor elected in Alabama since Reconstruction, winning 57 percent of the vote statewide against Baxley. Republicans held all nine seats on the Alabama Supreme Court  and all ten seats on the state appellate courts. Until 1994, no Republicans held any of the state court seats. In the 1994 general election, the then-incumbent Chief Justice of Alabama, Ernest C. Hornsby, refused to leave office after losing the election by precisely 262 votes to Republican Perry O. Hooper, Sr.. Hornsby sued Alabama and defiantly remained in office for nearly a year before finally giving up the seat after losing a long court battle that included a decision by the very Supreme Court of which he himself was the Chief Justice. This ultimately led to a collapse of support for Democrats at the ballot box in the next three or four election cycles. The Democrats lost the last of the nineteen court seats in August 2011 with the resignation of the last Democrat on the bench. Following the court ruling on the state's use of this system, the plaintiffs expanded their dilution claims in Dillard in an omnibus application to "include the at-large election systems to include other county commissions, county school boards, and municipal councils across the state." The amended complaint covered nearly "200 units of local government", challenging at-large systems in local jurisdictions in which blacks were at least 10 percent of the population. Most of the affected jurisdictions settled these cases by adopting single-member district systems (SMDs), which has resulted in the election of more blacks to local offices, generally in proportion to their part of the jurisdiction's population; this has resulted in more Democrats being elected to office. Limited voting schemes were adopted by 21 municipalities in negotiation with the plaintiffs, and another six jurisdictions adopted cumulative voting arrangements. As a result, total representation by black candidates has increased in local elections for municipal and county government, as well as county school boards. Elections have been held since 1988 under these alternative systems. In the 1968 presidential election, Alabama supported native son and American Independent Party candidate George Wallace over both Richard Nixon and Hubert Humphrey. Wallace was the official Democratic candidate in Alabama, while Humphrey was the National Democratic nominee. In 1976, Democratic candidate Jimmy Carter from Georgia carried the state, the region, and the nation, but Democratic control of the region slipped after that. In the U.S. House of Representatives, the state is represented by seven members, six Republicans ( Bradley Byrne, Mike D. Rogers, Robert Aderholt, Morris J. Brooks, Martha Roby, and Gary Palmer) and one Democrat ( Terri Sewell). Joshua L. Martin (I) [note 12] William Graham 20D, 13W 61D, 37W, 2?